We have a large selection of new electric motors in stock ready for pickup, delivery or installation at your location by our qualified electricians. If we do not have the motor you need in stock, we can special order any motor to fit your application. 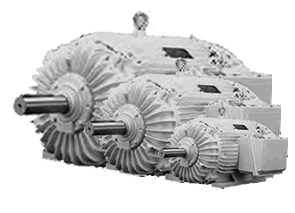 We can usually find replacement motors for older equipment where OEM replacements are no longer available. Be sure to ask us how you can increase efficiency and extend motor life by installing a variable frequency drive for you electric motor. We also have a large selection of used, rebuilt & rewound motors as well as field ran motors available for sale. We have a full in house rewind shop capable of rewinding motors from 0 to 200 horsepower. We stock and install motor sheaves, belts and shaft couplings, as well as mounting rails and bolts. Proper installation and alignment of these items can increase motor bearing, belt and sheave life. In addition to motor sales, we can offer you any number of custom motor controls to fit your specific motor application. We stock and install variable speed drives, programmable logic controllers, as well as standard line starter pump panels.